I have been merely existing in my study for too long; simply pushing the junk away from my desk and putting off really cleaning up the room. I can’t bear this any longer and must clean up now; but laziness overwhelms me. Help! The purple walls? A legacy of the teenaged girl that inhabited this space before we bought it. Not great for a study and adds to the dark, cave-like feel; I do intend to repaint the room some time, probably white, off-white or a light shade of grey. 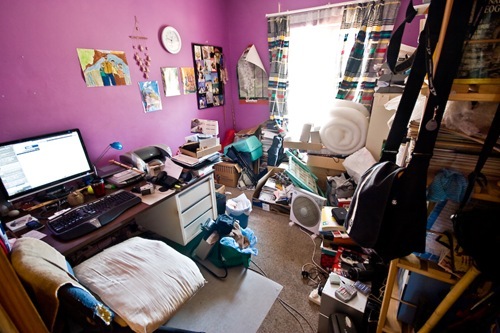 This entry was posted in Thoughts and tagged clutter, mess, office, room, study. Bookmark the permalink. Thanks for the offer but I need to do it carefully. It only looks like a pile of junk; some of it is worth keeping.